Facebook Offers Expands to Small Businesses in the U.S.
After a brief limited test in April, Facebook Offers are now available to small businesses in the U.S.
Facebook Offers — which was originally introduced at the Facebook Marketing Conference in February — allows local businesses to send discounts and promotions directly to customers through their News Feeds. Last month, the company announced a limited beta test of this product, making it available to a small number of premium advertisers and partners. While Facebook extended access to some Pages in New Zealand, Singapore, Australia, Japan, and Turkey, most U.S. Pages didn’t have access. 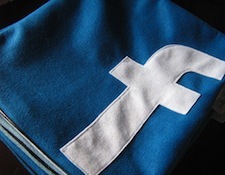 Now, any local U.S. business can start using Facebook Offers. You can create an Offer directly from the Publisher on your Timeline — you’ll be able to add a thumbnail, headline, and fine print. Unlike Facebook’s previous check-in deal service, you won’t need approval from the social network for Offers to go live. After your Offer has been created, it will appear on your Timeline and in some fans’ News Feeds. While Offers have limited reach, you can expand their distribution by using Sponsored Stories to target existing fans. Once an individual clicks on the offer, a coupon is sent to their email account. It’s important that local business owners train their staff on how to process Offers when customers bring in a printed email, or show their mobile confirmation. If you’ve ever accepted a deal from Groupon or LivingSocial, we imagine that it’s a similar process. 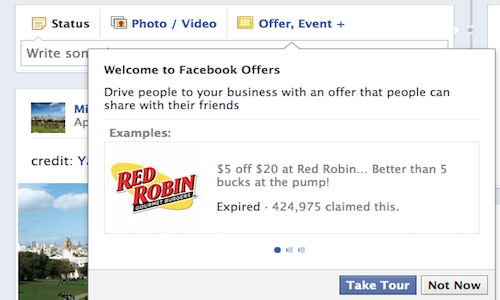 Facebook began rolling out Offers yesterday, so you should see the option soon if you don’t already. The company plans on continuing expansion, and international markets are likely to be next.